Since Britain's 2016 referendum on EU membership, the nation has been profoundly split: one side fantasizing that the referendum will never be acted upon, the other entrenched in questionable assumptions about reclaimed sovereignty and independence. Underlying the cleavage are primal myths, deeper histories, and political folk-legends. James Meek,`the George Orwell of our times', goes in search of the stories and consequences arising out of a nation's alienation from itself. In Dreams of Leaving and Remaining, Meek meets farmers and fishermen intent on exiting the EU despite the loss of protections they will incur. He reports on a Cadbury's factory shut down and moved to Poland in the name of free market economics, exploring the impact on the local community left behind. He charts how the NHS is coping with the twin burdens of austerity and an aging population. 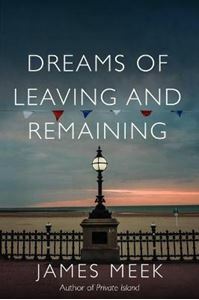 Dreams of Leaving and Remaining is urgent reporting from one of Britain's finest journalists. James Meek asks what we can recover from the debris of an old nation as we head towards new horizons, and what we must leave behind.There are no easy answers, and what he creates instead is a masterly portrait of an anxious, troubled nation.